1. Billiards evolved from a lawn game similar to croquet played sometime during the 15th century in Northern Europe. 2. 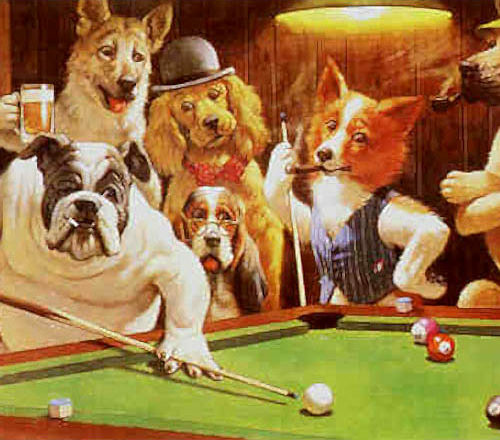 In 1765 A.D., the first billiard room was built in England. Played there was One-Pocket, which was a table with one pocket and four balls. 3. The dome on Monticello, Thomas Jefferson’s home, conceals a billiard room. 4. In the 19th century a poolroom was a betting parlor for horse racing. Billiard tables were installed so patrons could pass the time between races. 5. In 1873, billiards became the first sport to have a world championship. 6. The first coin-operated billiard table was patented in 1903. The cost of a game on the first pay-for-play table: one penny. 7. The term “scratch”, as applied to a pocketing of the cue ball, was derived from the penalty assessed for such a foul. In pool’s early days, the score was often kept on a chalkboard. When a player pocketed the cue ball, his opponent “scratched” a point off the shooter’s score. 8. Tom Cruise did his own trick billiard shots for the 1986 film, The Color of Money, except for one in which he had to jump two balls to sink another. Director Martin Scorsese said he wanted to let Cruise learn the shot, but it would have taken two extra days of practice, which would have held up production and cost thousands of dollars. The shot was instead performed by professional billiards player Mike Sigel. 9. In 1586, the castle of Mary, Queen of Scots, was invaded and captured. The Invaders made a note of forbidding her the use of her billiard table. They then killed her, and used the covering of the table to cover her body. 10. The first coin-operated billiard table was patented in 1903. The cost of a game on the first pay-for-play table: one penny. 11. Before the invention of celluloid and plastics, billiard balls were made out of ivory. Because billiard balls had to be cut from the dead center of a tusk, the average tusk yielded only 3 to 4 balls. 12. Before the invention of celluloid and plastics, billiard balls were made out of ivory. Because billiard balls had to be cut from the dead center of a tusk, the average tusk yielded only 3 to 4 balls. 14. During the Civil War, billiard results received wider coverage than war news. 15. Pool is one of the safest sports in the world. Ever heard of a game called “One Pocket”? You can learn about it here!